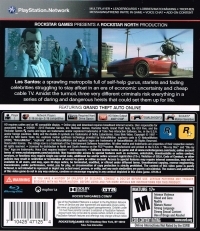 Box Text: Los Santos: a sprawling metropolis full of self-help gurus, starlets and fading celebrities struggling to stay afloat in an era of economic uncertainty and cheap cable TV. Amidst the turmoil. three very different criminals risk everything in a series of daring and dangerous heists that could set them up for life. 09-20-2013 Seikenfreak Box Text Los Santos: a sprawling metropolis full of self-help gurus, starlets and fading celebrities struggling to stay afloat in an era of economic uncertainty and cheap cable TV. Amidst the turmoil. three very different criminals risk everything in a series of daring and dangerous heists that could set them up for life. This is a list of VGCollect users who have Grand Theft Auto V in their Collection. This is a list of VGCollect users who have Grand Theft Auto V in their Sell List. 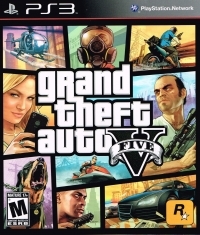 This is a list of VGCollect users who have Grand Theft Auto V in their Wish List.